In this post I’m going to discuss how our cumulative diverse experience is sometimes the exact background needed for a position. Shortly after graduating with my bachelor’s degree, I married a submariner. Being a Navy family guaranteed a steady rate of moving. This mobility helped inform my decision to become a librarian. We could be stationed just about anywhere and there would be potential employment. I attended the State University of New York at Albany (SUNY-Albany) and earned my MLS shortly after our third child was born. My career began with two short-term jobs. I was first a reference librarian at Utica College and then a hypermedia development librarian at Rensselaer Polytechnic Institute. These experiences grounded me in instructional theory, user services and technology. As we left the military to explore civilian life, the economy was challenging and I once again found myself working through short-term positions. I gained architecture experience at Roger Williams University. This is also where my classes began to integrate web resources. Rhode Island College included a broad range of instruction and expanded reference experience. At Helix Technology Corporation, a manufacturer of cryogenic vacuum pumps, I had my first permanent, full-time position with benefits. My undergraduate engineering experience was used daily as I served scientists and engineers. I was thrilled! Wanting to build on this technical experience and continue to grow, I next went to MIT to work as a business librarian. My science and technical background served me well as I developed industry research guides and worked with a range of statistical products. By now I was grounded in the humanities, social sciences and hard sciences. I had several years of teaching experience and could leverage technology to create tools and services. We faced a family move once again, and this is when we headed to Oregon and I had my Weiden + Kennedy experience. I could now add advertising and library start-up to my background. When the 2001 dot-com bubble burst, I was laid off. While temporarily devastated, I decided to use the opportunity to explore my own business, first with a partner and then on my own. This entrepreneurial period taught me a great deal — about business plans, strategy, marketing, finances and the like. Perhaps my most valuable lesson was that I was passionate about the work, but not about finding each new client. I believe that opportunity frequently aligns with readiness. Parallel to these years of career growth across multiple sectors was my increased involvement with SLA. I had been most active with the Information Technology Division and the Information Futurists’ Caucus. A colleague and mentor from both units sent me a message asking if I was interested in applying to be the library director at a new engineering college. The school was back east, and the opportunity felt right on many levels. Remarkably, the school wanted a library leader with a sci-tech background who also had start-up experience. An entrepreneurial background was a plus. The position almost defined my path. I applied to Olin College of Engineering, and the next 11 years were full of creativity, new growth and relationships, and partnership-building within the school, to other colleges and universities, and to the vendor community. 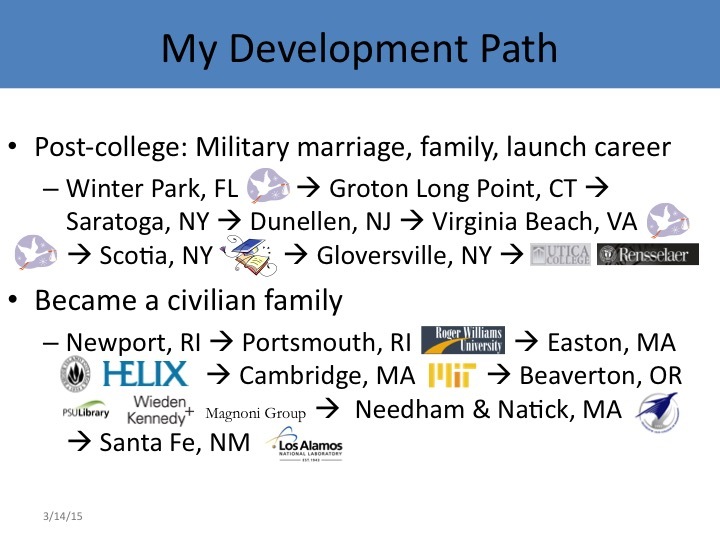 I would not have been offered the position at Olin College if I had not traveled my diverse career path. Each experience was valuable. Each experience was an opportunity to grow. SLA was with me throughout my development, and my increased involvement helped lay the path to Olin College. What to learn from this? Value your life experiences. Be alert for opportunities. Share your gifts with your colleagues. Your own career will blossom.